Visit the San Diego Wildlife Park run by the world-famous San Diego Zoo. 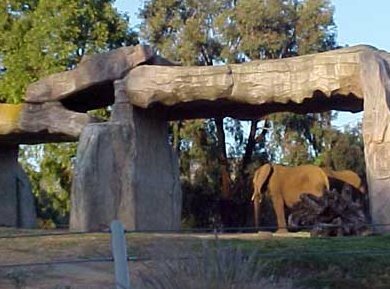 Recently they renamed this park the San Diego Zoo Safari Park. If you wish you could go on an African Safari, this is the wildlife park for you. See animals close up and in a natural habitat via a tram ride. Located just 30 minutes from San Diego California, the wildlife park covers 1800 acres and is home to over 400 different African animal species including rhinos, elephants, zebras, and those beautiful large cats. 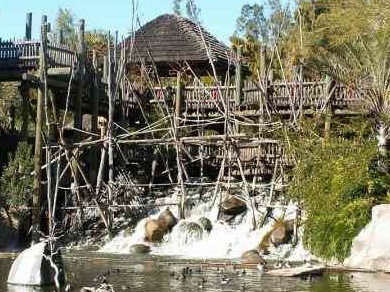 Formerly called the San Diego Wild Animal Park, this is my favorite animal theme park in California! You'll definitely want to come back again. Let’s take a ride “behind-the-scenes” and experience a wild adventure. You will be traveling by guided cart and will be visiting areas that only the keepers are allowed in. 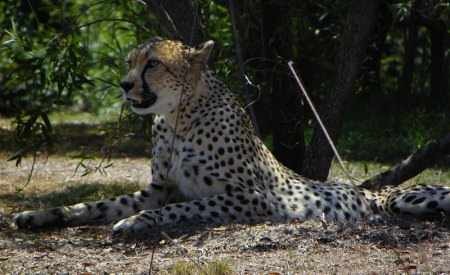 There are several safaris to choose from depending on your adventure choice. The Safari Park also offers a state of the art veterinary medical center where you can learn all about the history of veterinary services provided to these amazing animals. There is even an adventure for families with little critters that includes a petting zoo and chance to feed some pretty cool animals. For more information check out the website link below or call 619-718-3000 and make reservations. When you are done “behind-the-scenes” head on over and take a ride on the wild side via the amazing zip line. 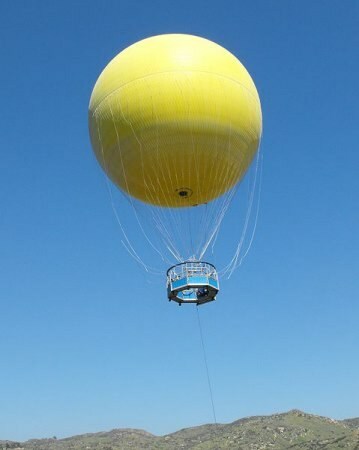 You will soar above the wildlife and experience the park as you have never before. The zip line is a 2/3 mile ride, and you will soar 160 feet directly over some of the coolest animals ever. Bring your camera and zoom lens for some spectacular shots. Still not enough? How about the Jungle Ropes Safari? Here you will have a chance to “monkey” around on the rope course that is sure to offer a challenge and plenty of adventure. Maybe you are more of the spectator of spectacular? Then I would advise the African Tram Safari where you will sit comfortably on the tram and view all of the amazing animals in their natural open-air exhibits. Your tour guide will have many interesting facts to share. On a more personal note, the Safari Park offers a wonderful Caravan Safari as well, where you will have the opportunity to caravan out into the open playing fields of the giraffes and rhinos and get up close and personal with the animals. San Diego Wild Animal Park Located about 30 minutes northeast of San Diego CA, this wildlife park is a dramatic 1800 acre animal and plant preserve that was originally a California breeding facility for endangered species for the San Diego Zoo. What To See and Do - Ride the African Express for a 30 minute excursion through the park's five animal enclosures. Seating on the right offers the best view. The Heart of Africa Walk and Kilimanjaro Safari Walk are great too. For some extra money, you can take guided small group tours (reservations required - expensive, but a great group experience, and you can even feed a giraffe), or for a thrill, ride the zipline. Small visitors will enjoy the Petting Kraal. Operating Hours: Open every day of the year, including holidays. Open 9 AM, closing time varies. Parking: $12 for vehicles, $17 for RV parking. 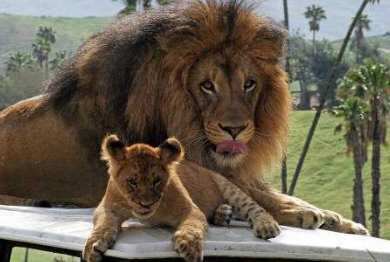 Food: The Wild Animal Park in San Diego Cal. has a number of dining facilities and food stands, including all-American or international fare, snacks, and healthy alternatives. You can visit for 1 or 2 days and see most everything in the park. For ticket prices see San Diego Zoo Ticket Prices, but you can also get some discounted tickets. Admission to San Diego Wildlife Park (San Diego Zoo Safari Park) is also on the San Diego Go Card. 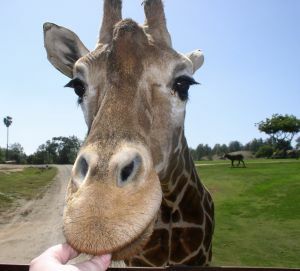 For San Diego Wild Animal Park Coupons, Discounts and go Card see Wild Animal Park Discount Tickets and Coupons. The park also offers a Cart Safari and a Roar & Snore Safari. With the Roar & Snore Safari you can choose between an Adults-only sleepover or an All-ages sleepover. 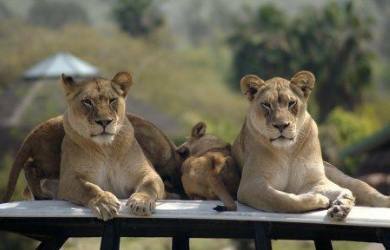 You will have a chance to the see the Safari Park like never before and will retire to tent accommodations. There will be activities for after-hours and your tour will include guided walks, a delicious dinner and breakfast as well a campfire program and you will leave with a souvenir to remember your wonderful excursion. My kids loved it! This is a fun group or family activity and reservations are required. Address - San Diego Wild Animal Park is located east of San Diego at 15500 San Pasqual Valley Road, Escondido, California 92027. Driving Directions from North County, Orange County or LA - From Interstate 5 in Oceanside Cal, go east on highway 78 , south on Interstate 15, exit at Via Rancho Parkway (Exit 27) and follow the signs to the Wild Animal Park. From Interstate 15 (Riverside), exit at Via Rancho Parkway (Exit 27) and follow the signs east to the Park. Driving Directions from San Diego CA - Take highway 163, proceed north on Interstate 15 to the Via Rancho Parkway exit (Exit 27). Go east and follow signs to the SanDiego Wild Animal Park in Escondido, Calif. Directions by Car from Imperial Valley, Arizona - From Interstate 8 go north on Interstate 15 to the Via Rancho Parkway exit (Exit 27). Follow the signs east to the San Deigo Wild Animal Park. Click on the link above to open the Google Map for San Diego Zoo Safari Park and other attractions in San Diego and southern California.